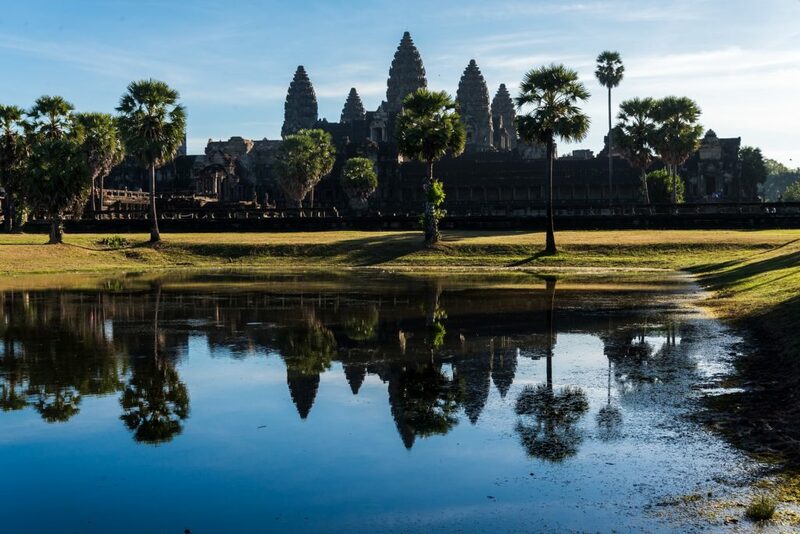 The temples of Angkor are Cambodia’s most iconic sight. They used to be the center of the ancient Khmer empire. 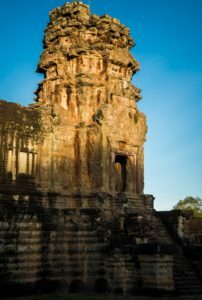 It is a complex of multiple temples, some in better state than others, spread across thousands of hectares near Siem Reap. 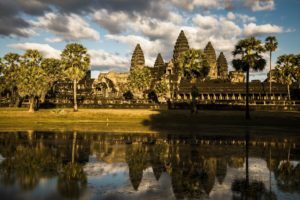 Most people know of Angkor Wat, the biggest and most popular of them all which is the largest religious building in the world, covering approximately 200 hectares – but there are tens, if not hundreds more. 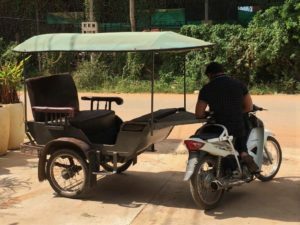 We reached Siem Reap the day before, so we had a bit of time to walk around the town. Our plan was to wake up as early as possible, be there before the sunset, get back to the accommodation during noon for an hour or two of sleep and then get back to the temples in the afternoon to stay until after the sunset. We decided to hire a tuk-tuk for the three days we were there. We found a really friendly driver, who also spoke quite good English – he learnt it in a pagoda – he told us later. We decided to go to Angkor Wat on the first morning. You will want to arrive there early, while it’s still dark. The reasoning behind getting up so early is that most importantly we were trying to photograph during the golden hours – that are approximately 15 minutes before sunrise, around one hour after, around one hour before sunset and 15-30 minutes after sunset. 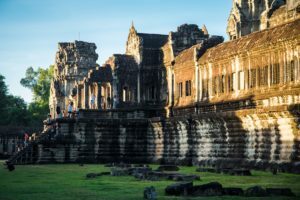 For the most part this rule applies to landscape photography, but since the temples (or at least Angkor Wat) are out in the open, the warm soft light that is present at sunrise and sunset is excellent for photographing them. I know, I’m not a morning person either, but it’s worth it. Firstly, if Angkor Wat is your destination, there will be crowds. Secondly, you want to have a bit of time to look around and choose a good spot for either watching or photographing the sunrise. A headlamp will probably be helpful in these situations. Now when it comes to photography (and almost anything else really) a bit of research goes a long way. You will want to know the hours of sunrise/sunset and the direction of the light during sunrise and sunset. Before going you might want to decide what kind of photo you want – if it’s a silhouette you are after, pick a spot facing the sunrise. 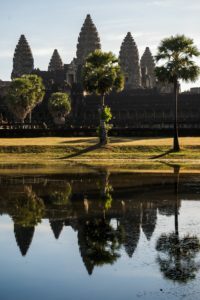 There are two lakes to the left and right of the causeway as you approach Angkor Wat, use them for a reflection photo. For our first photo we decided to go behind the temple, since the lakeside was already full (not early enough, and we also had to buy tickets) and we wanted to catch the soft sunlight on the temple itself. So we set up our tripod and waited – in vain, since clouds were covering the sky on the east side. We took some pictures nonetheless, since it is not everyday that you see such a magnificent building. About 2 hours later, the sun finally started piercing the clouds – and I ended up with this image, where the sun hits the tower, but only covers it halfway, stopping right above the entrance – giving it a mystical atmosphere. After walking around the interior a bit, we found a Buddhist monk who was giving a blessing ritual to everyone willing to accept it. I took out my shoes and slowly I stepped on the mat in front of him, ready to receive my first Buddhist blessing. After this we decided to go back in front and try our luck with reflection. The sun was already a bit higher in sky and it started to become a bit hazy, as you can see in this following shot, where all 5 towers of Angkor Wat can be seen. As we were getting back to our tuk-tuk, we took the obligatory compass shot as well with the temple in the background. We came back the next day in the afternoon, for some sunset shots as well. We wandered around a bit before setting up our tripod across the lake. While waiting, I got harassed by some monkeys who were out to get my mango. One even jumped on by back, looking for stuff in my backpack. Luckily, as soon as they saw that I have nothing of value for them (except my mango) they went away. 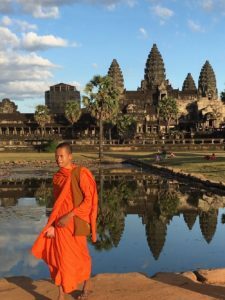 We also noticed some monks around – and ended up with these shots – combining two of the most iconic sights in Cambodia into one. Previous Post Kayaking in Wales – Wye not?! 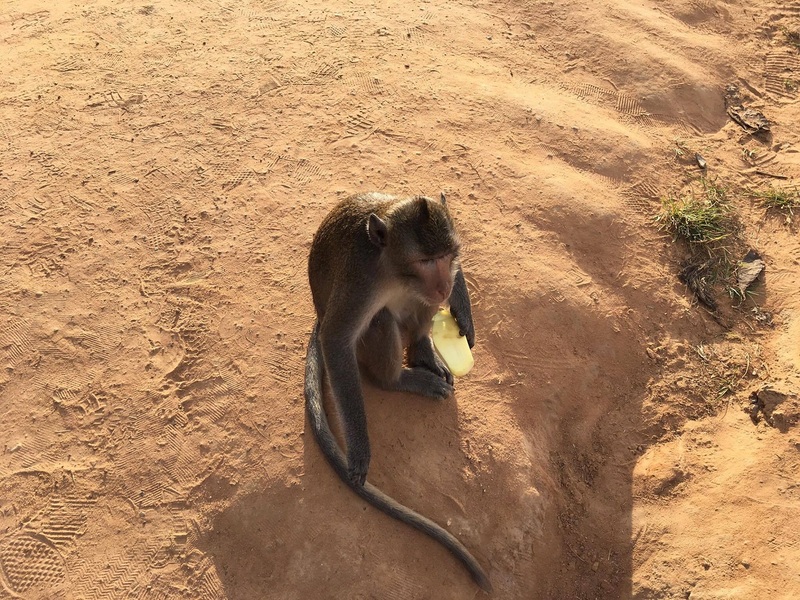 I loved the monkey who stole your mango. They can be so aggressive! A monkey jumped on my back in Mexico and went through my purse but luckily didn’t steal anything. Your pictures are gorgeous, we would love to visit Cambodia one day. It’s funny how such a small animal can be so persistent and aggressive. I am glad those cheeky monkey didn’t steal anything from you. Hope you will visit Cambodia, it’s absolutely amazing. Beautiful shots Oana! 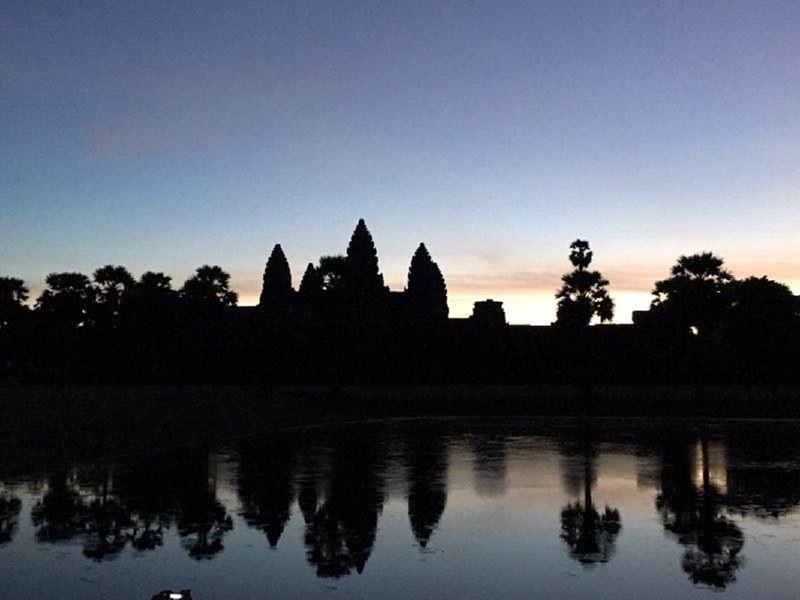 I couldn’t be bothered to go to Angkor Wat before sunrise (way too early for me! ), so by the time I got there at mid-day, I didn’t get too many good shots. I love the reflections at the pond and the shots with the striking orange robes of the monks. Thank you, Anna. It was hard for me to wake up so early 3 days in a row but in the end it was worth it. The pictures with the monks are my favorites as well. Thank you, Paul and Carole. Angkor is amazing, I would definitely recommend it. Such an interesting place to visit. 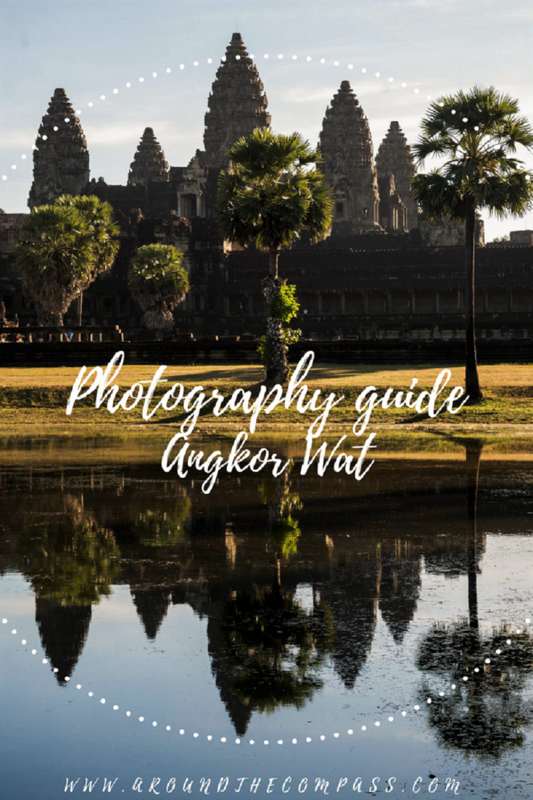 The pictures are breathtaking, especially the one with the reflection on the Angkor Wat. Thank you for sharing this place with us. Thank you, James. Angkor Wat is indeed an interesting place to visit. Thank you, Garth. It’s great how one person can relate with pictures of other travelers after they’ve visited that place. The monkey were cheeky, it was funny when they harass someone else but not so much when they jump on your back. This place looks so calm and peaceful. I wouldn’t mind spending a week there, with no phone or internet connection, just walking around, watching the sunrise and sunset and meditating inside the temples. Loved the photos! Thanks Elena. I can definitely spend more time in there without internet (not without my phone) if I have a chance. It’s a place that will steal your heart from the first moment. Beautiful pictures! I have never been to Angkor but I have visited Prasat Phnom Rung in Buriram, northeastern Thailand, which was built around the same time as Angkor Wat by the Khmer. Interesting post! Thank you, Raymond. 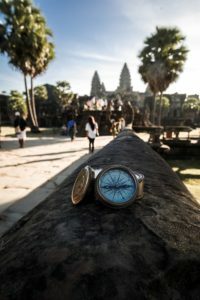 Although many temples have loads of similarities, there is something unique in each of them that makes you want to discover more and more about the place. Love your photos and this post reminded me of a great few days I spent in the area a few years back. 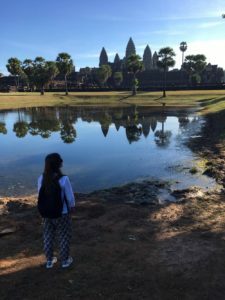 Angkor Wat is so beautiful and I really loved watching the stunning sunrise early one morning. Glad you got to experience it too! Alex, it was really hard to wake up so early every single day but it was worth it. The most beautiful sunrises of my life so far were at Angkor. Angkor Wat remains a dream destination for us. It is cultural fusion in architecture. Love the Preah khan temple and the richly decorated Khmer temple. The photographs are beautiful and have captured more than just the architectures, they have captured the spirit of the place. Sandy, thank you for your kind words. 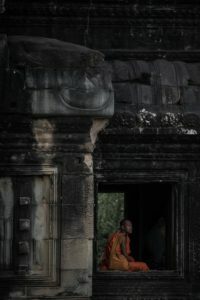 Angkor is a place full of history, a place that will leave a mark on you from the moment you step foot near any temple. I love these photos! We went two years ago and loved the silhouette at sunset – yours looks so much better though! 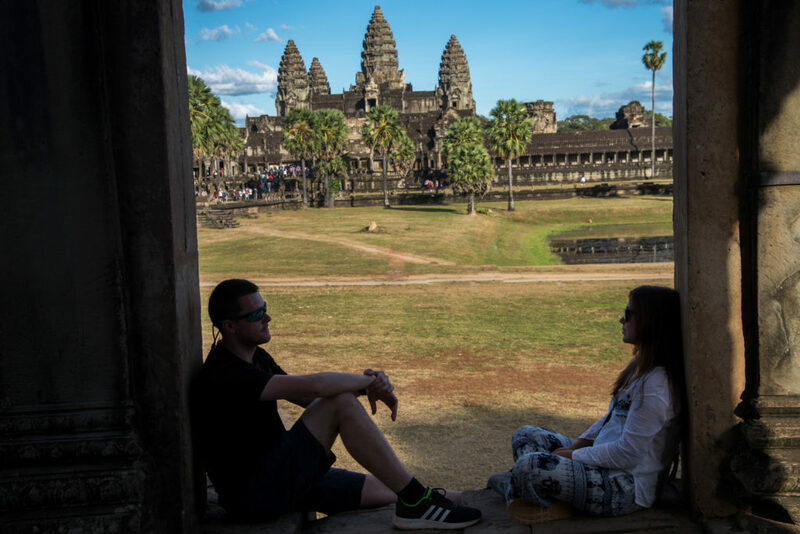 Thanks Rob, that’s why we chose Angkor Wat – we wanted to be the first temple bathing in sunshine. I bet yours looks as nice as ours. Love the photographs of the monks they are fantastic! As are all your pictures! Pinning – hoping to get there this year so this will be invaluable! Tracy, I would totally recommend to visit Angkor. The pictures with monks are my favorite, especially because it was something spontaneous. Lisa, I am not an early riser but when I travel I make some efforts because I know I will regret after if I don’t. Hope you will get there one day. Thank you Rob and Ann. I hope our information will be helpful for someone in the future. That’s a beautiful post! I’ve never been to Cambodia but love to go one day. Thanks for sharing! Thank you, Sina. I hope you will go one day, it’s totally worth it! Anna, Angkor can be a magical place where you can find your interior peace. Thank you, Diana. I haven’t had a conversation with any monk although I would love to. 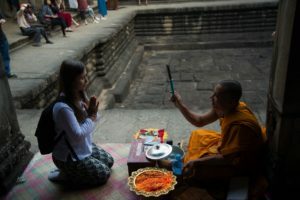 I received only the blessing from one at Angkor Wat which for me was a unique experience. Great photography pointers! I think I would scream if a monkey jumped on me. I’m terrified of them! Other than that, I think I would have a wonderful time checking out the scenery. Don’t worry, I screamed as well as I was afraid they will be aggressive and bite me – I was thinking just about the fact I don’t have the rabies vaccine done. Monkeys can be cheeky and scary sometimes. Despite not originally wanting to go I had a great time visiting the Temples. I only took my Nokia smartphone and got a few good shots but would love to go back again with my ‘proper’ camera and get some better shots. Barry, I had just my phone while Cristi has his camera. I took some nice shots as well, sometimes probably better then his. I would love to go back just to relax and disconnect from real real life for a day or two. Fantastic photos of a fantastic place! 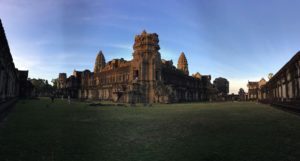 I absolutely loved visiting Angkor, but wish I had been a bit more advanced with my photography skills at that point. This guide would have definitely helped. Ah memories! It is indeed a fantastic place. I wish I knew more about photography when I first start travelling as well. I hope this guide can help someone in their next adventures. Angie,you will love it. You can enter to some temples before the opening hours but unfortunately at Angkor they kick you out at 17:30 and you don’t get a proper sunset. Thank you, Ed. 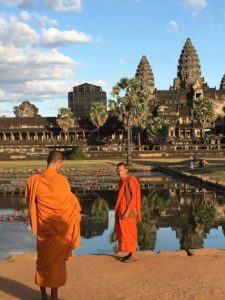 Angkor Wat is worth visiting while in Cambodia.